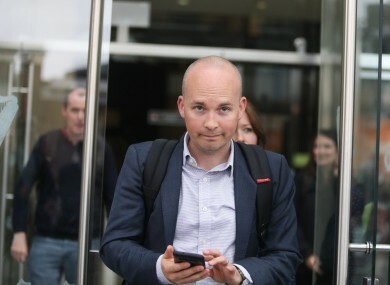 Paul Murphy leaves the Central Criminal Court during the Jobstown jury's deliberations. ANOTHER DEBATE CAUSED by the use of Dáil privileges has popped up – this time, because of comments made by Paul Murphy about gardaí’s testimonies during the Jobstown trial. So here’s a quick refresher on what Dáil privilege is, and how it could be breached. Yesterday, Paul Murphy’s remarks – uttered in the Dáil on Wednesday – were called into question by the Ceann Comhairle Sean Ó Fearghaíl, who sought legal advice before referring them on to the group that decides whether TDs have abused their privilege. That group, the Committee on Procedure and Privileges, will consider whether the comments were in breach of Dáil privileges, and report back on their findings (which could be months from now). When assessing abuse of privilege, the committee makes considerations as to whether comments were in the public’s interest – and if they’re not, they could be considered defamatory. During Leaders’ Questions on Wednesday, Murphy used his Dáil privilege to accuse gardaí of committing perjury during the recent Jobstown trial, saying he believed “numerous gardaí lied under oath… in a coordinated way”. Responding, Taoiseach Leo Varadkar’s said scenes at the Jobstown protest were “ugly” and “violent”, and accusing Murphy of “thuggery”. Today, Solidarity-PBP TD Paul Murphy accused Taoiseach Leo Varadkar of defaming him by using those words. Members of the Dáil, Seanad and committee speakers have certain privileges, or slight exemptions from law, that are set down in the constitution. TDs and Senators may not be sued for defamation because of any speech in the House. This privilege protects members both in the House and at Committee hearings. The intention of this privilege is to allow TDs to raise points in the chambers that need addressing without fear of being pursued in the courts. In 2015 and 2016, Social Democrat TD Catherine Murphy made claims in the Dáil about businessman Denis O’Brien’s finances under Dáil privilege. The Committee on Procedures found her comments not to be in breach of Dáil privilege, and the High Court agreed when the decision was legally challenged by O’Brien. In December, Fine Gael TD Alan Farrell used Dáil privilege to name Sinn Féin TDs Dessie Ellis and Martin Ferris in connection with the murder of prison officer Brian Stack, who was shot dead in 1983. His comments were brought before the Committee on Procedures, which found Farrell did not abuse Dáil privilege. In April, Pearse Doherty used Dáil privilege to highlight that claims of tax evasion and social welfare fraud against a now retired superintendent and made by a current garda were not investigated or followed-up. Ireland has relatively strict defamation laws, as recognised in a media freedom report that marked Ireland down for how it can restrict reporting in Ireland. Comments made under Dáil privilege can be reported on providing they are accurate accounts of what was said in the House chambers (comments made about the privileged statements aren’t included under privilege). Email “Explainer: What is Dáil privilege and how can it be breached?”. Feedback on “Explainer: What is Dáil privilege and how can it be breached?”.